This competition was established jointly in 1981 by Soroptimist President, Republic of Ireland, Mildred O'Brien, and Soroptimist President, Northern Ireland, Marie Brownlee. It is open to girls in second level education, between the ages of 15 and 18, from schools North and South. 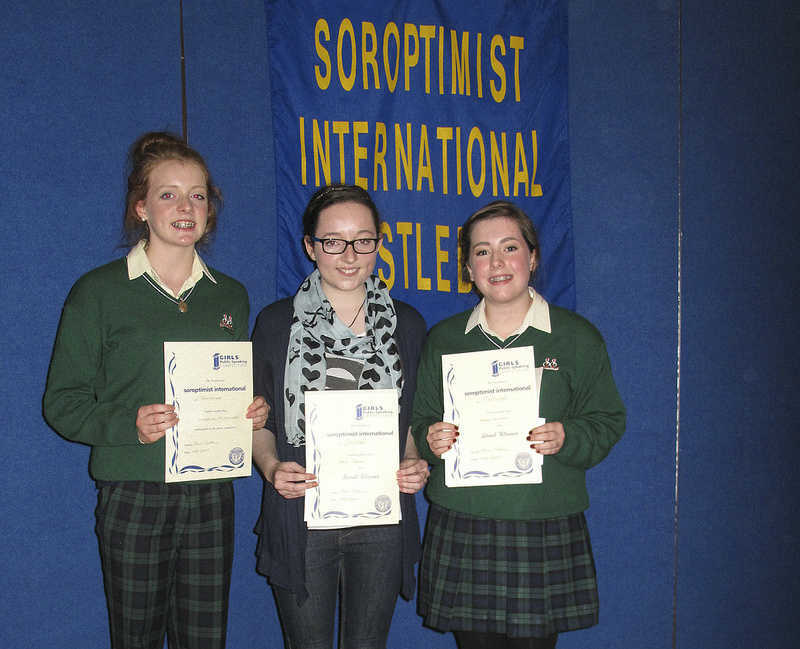 Soroptimist International Castlebar have been involved in the competition for many years and are very proud of the girls who have represented us down the years at local, regional and national level. Schools in the area are notified in mid September and the local competition takes place in November. Last year we had twenty three girls from seven schools in the area participating in the competition. The schools who participated were from Gortnor Abbey Secondary School Crossmolina, Sacred Heart Secondary School Westport, Ballinrobe Community School, Mount St. Michael Secondary School Claremorris, St. Louis Community School Kiltimagh and Davitt College Castlebar. Two winners and one reserve are chosen on the day to go forward to the regional final which is held in the spring. This years local winners are Amy Crean representing Mount St. Michael Secondary School Claremorris, and Sarah Murphy representing Sacred Heart Secondary School Westport. The runner up was Dearbhail McNamara representing Sacred Heart Secondary School Westport. The Regional heat will be held in Ennis on the 9th February 2014 and we wish our girls all the best of luck and hope to see them partiicipate atthe National Finals which are due to be held in Thurlas on March 8th 2014. This years winners and runner up of local heat. Copyright © 2017 Soroptimist Castlebar All rights reserved.